Red Cross volunteers help families and children in times of disaster. Most people are well aware of at least some of the activities of the Red Cross USA, but not everyone knows how to get involved with the organization. Volunteering is easy to do and can encompass anything from learning CPR and First Aid to being on call to help out in a domestic disaster. Some other vital services provided by the Red Cross are support and compassionate services to the military and needy, blood collection and distribution services, and international disaster relief. The organization also offers employment opportunities for qualified individuals as well as the Red Cross Shop where you can shop for all your emergency preparedness and first aid needs. The Red Cross in the USA provides comprehensive services in a variety of situations. If you're wanting to volunteer, it's important to know what it is that the organization does. Disaster Relief: The Red Cross USA will swoop in during a disaster and help families and victims with whatever needs to be done. This includes helping families find shelter in the event of a house or building fire or communicating with loved ones in a larger emergency. The Red Cross is likely to respond to an many made or natural disaster that occurs. 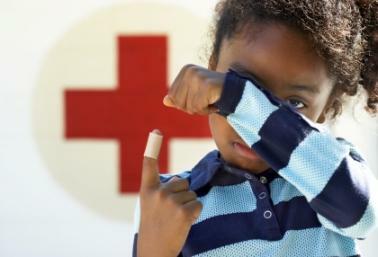 Preparedness: The American Red Cross offers comprehensive education on how to be prepared for the emergencies that are most likely to hit your area. Blood Donation: The Red Cross is the "middleman" between those who willingly donate blood and between hospitals and other places that need blood products. Military Service Members: The Red Cross keeps soldiers who are far from home connected to their families. If there is an emergency that strikes a family while a soldier is deployed, the Red Cross will make it a priority to get a message to the soldier in the field. Health and Safety: While the Red Cross has made a name for itself responding to disasters, they also hope to prevent them through health and safety education. International Disaster Relief: The American Red Cross works with the International Red Cross and Red Crescent Movement to provide relief to disasters and other humanitarian crises throughout the world. Volunteers can get involved in any one of these aspects. The Red Cross in the USA is run by hundreds and hundreds of volunteers. If you're looking to volunteer with the Red Cross, rest assured there's something for everyone. No matter what you want to do, there are a variety of ways in which you can volunteer for the Red Cross. They even have opportunities for teens and young people! Donate Your Money: The Red Cross carries out a variety of activities that require funding. You can donate to the Red Cross online to one of several causes. Give Blood: Every two seconds, someone is in need of blood and thanks to volunteers who donate blood every year, the Red Cross helps provide it. To find out more about donating blood you can check out the Red Cross website. Before you head to a donation center though, make sure to see if you're eligible. While donations are necessary to keep the Red Cross doing what they are doing, maybe you want a more hands on approach to volunteering? The first place to stop is the Volunteer Match form at the American Red Cross Site. You can input your zip code and a keyword or a description of your skills and the database will search all available opportunities. Because the Red Cross is involved in so many areas of relief, education and public policy, there is never a lack of opportunities. If you're wanting to know what is available, check out their Volunteer information page. The Red Cross offers comprehensive training for all of its volunteers. However, you might be surprised that you have one of the special skills for which they are always looking for. While you certainly don't need to have any of these talents to volunteer, if you have them, you may well be able to volunteer in capacities that you hadn't though of. How about the time commitment? Whether you have a little time or a lot of time, the Red Cross USA still has something for you to do. From one-time events to almost full-time efforts, you can commit as little or as much time as you want. In many ways, the American Red Cross and related agencies like the International Red Cross and Red Crescent movement actually have led the way in pulling together comprehensive volunteering for the purpose of reaching out to those afflicted by a disaster or tragedy. By offering opportunities and compassionate services for kids, teens, seniors, and groups, this is an organization that has something for everyone.